In Winter Park’s first run-off election, voters sent incumbent Pete Weldon packing and handed Todd Weaver a comfortable 285-vote victory — a margin of 4.6 percent. Typically, run-off elections draw fewer voters, but voter enthusiasm generated by this runoff was high. Vote-by-Mail was greater than normal. As the last ballot was counted, more than 700 additional voters had cast ballots in the runoff. That’s an increase of 13 percent over the vote in the March 12 general election. Did Republican Electioneering Steer Voters to the Polls? 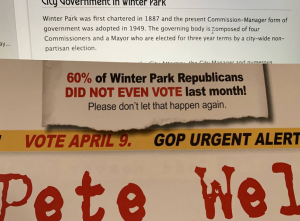 The Winter Park City Charter mandates that Commission races be non-partisan, but since 2012, the Orange County Republican Executive Committee (OCREC) has ignored the Charter and played an active role in Winter Park elections. Here is one example of an OCREC mailer sent on the eve of the April 9 runoff. Republican voters were subjected to a barrage of OCREC-sponsored mailers, emails and robo-calls. 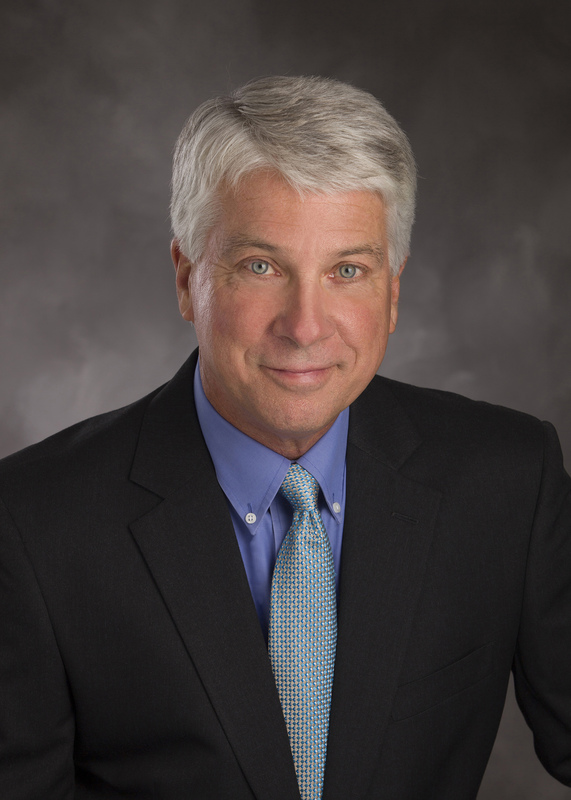 Weldon won big in the heavily Republican Precinct 1, where voter turnout was up 15 percent. 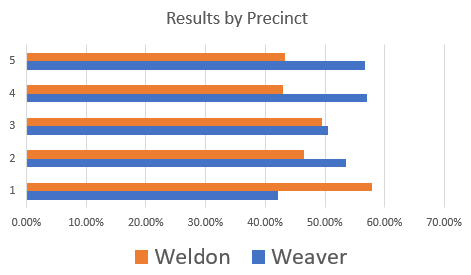 OCREC electioneering seemed to have less impact elsewhere, however, and Weaver easily carried the other four precincts. Weaver also appears to have benefited from the endorsement of former candidate Barbara Chandler. Almost half of Ms. Chandler’s votes in the March 12 general election came from Precinct 4, which includes both the traditional West Side neighborhood and the Lee Road corridor. Weaver targeted the Lee Road neighborhoods with a message about controlling traffic and development and had his best results in Precinct 4. Did the Run-Off Deliver a Message about the Canopy Project? High voter turn-out and a clear win for Weaver may make the City sit up and take notice. The main plank in Weaver’s platform was that the Canopy Project has gone astray. He pointed out that the project – particularly the events center — is over budget and not delivering what the voters were promised – a bigger library. Weaver suggested we hit the pause button and re-evaluate the project in light of current cost projections and City leaders’ plans to use the Canopy events center to attract tourist dollars. Thank you Sally Flynn, Sandy Sherrill Womble (amazing investigative revelations, one after the other), Beth Hall (brilliant analyses), Chele Hipp (from succinct “SMH”to great analyses), Barbara Chandler, Carlton Johnson (great cheerleading everywhere), and Peter and Chris Gottfried (smart and witty “The Accolade by Leighton graphic was perfect). It was a narrow win. Some of us are guessing that many still do not know the Canopy had morphed into an international tourist wedding destination venue to support lower-end hotel developers and discount retailers. We’re wondering if the WP Chamber’s intent is to try to attract tourists who can’t afford theme weddings at Disneyworld and stays at Disneyworld hotels and shopping at Millennia. The Sentinel reporter’s comments on FB indicated that he did not know that the Canopy is now a convention center, not just an event center/library. We’re hoping for continued political dialogue, especially with the West Side leaders and with well-informed aforementioned community leaders of WP. I voted for Weaver. Only the second “democrat” in my lifetime. I am horrified he gave money to Grayson, but I’m more horrified at the idea of becoming I-drive north or Baldwin Park part Deux. The library debacle and apparent indifference to traffic congestion (inevitable with the density the developers want) were also factors. I was hit with numerous mailers and emails encouraging me to vote for the conservative. I found this very disheartening. 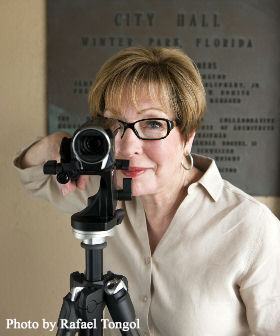 I’m a free thinker even if I’m Republican….and I think I want the special character of Winter Park preserved. Thank you Life Long Republican for voting for what is really important for Winter Park. also, after the Republican Party got involved in the Mayor’s race a few years ago. Thank you Winter Park voters for getting it right. A team of Ol’ Bags beat the team of Ol’ Boys. The City of Winter Park is better off for this grass roots based win. Development related interests and PACs could not fend of “we the people.” Dowless and his brand of politics should be retired along with Mr. Weldon. 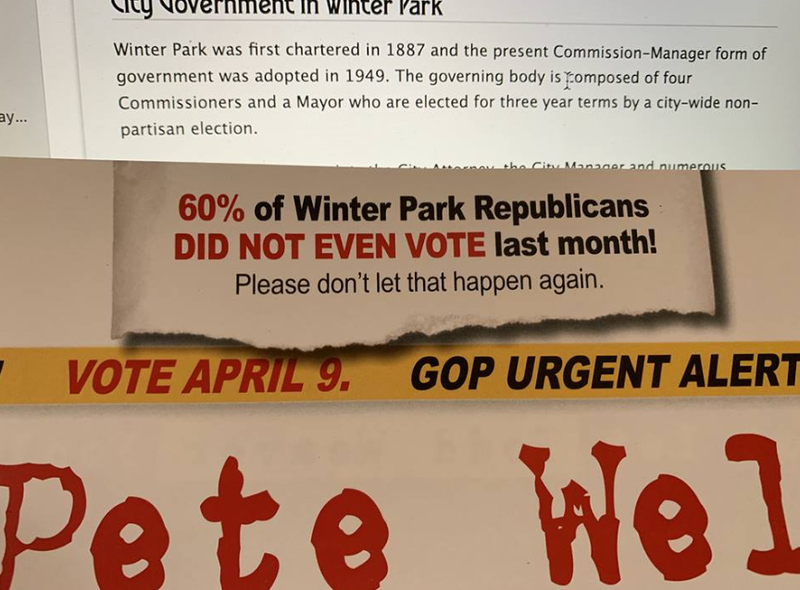 Whoever was behind the simplistic Weldon mailers to Republicans in Winter Park needs to be fired. However, when other usually chill Republican neighbors and I started receiving the mailers from the Orange Cnty Republicans that invaded Todd Weaver’s privacy, then mail-in ballot solicitations invading our privacy, we felt insulted and annoyed. So when I passed a group of Weaver supporters at the University Club, I impulsively stopped and asked for and distributed Todd Weaver campaign signs. Meeting them was like a shot in the arm. They were gracious, intelligent, well-educated, well-mannered. They reminded me of everything I loved about American culture when I majored in “American Studies” at U.F. Then my friends (both parties) initiated a text, email, and word-of-mouth campaign — crossing party lines. When we watched the video of the community dialogue hosted by the Friends of the West Side, we became even more excited about the community leaders in local politics in Winter Park. The moderators are brilliant and civil, as well as civic-minded. Winter Park is not the former Soviet Union or Maoist China. We all don’t follow the “party line.” We respect political differences and appreciate diversity of all kinds in our neighborhood. My Republican, Democrat, Libertarian and Green Party friends and I voted for Todd Weaver because we love centuries-old trees, water, parks, green space, and neighborliness (lessening traffic, good manners, civility). We voted against deceptive “bait and switch” tactics, corruption, lack of transparency, and disrespect of residents by city politicians. We also voted for Todd Weaver because of his integrity and competence. We just like and admire him and his supporters. What a great group of Americans. We’re committed to supporting them and the Hannibal Square Heritage Center. If the city wanted residents to pay to build a convention center/international tourist wedding venue flanked by library — the same size as the one the city said was too small when it initiated a $30 million taxpayer bond to pay for the convention center/library– in Dr. Martin Luther King, Jr. Park — then they should have set forth these terms in their bond initiative. But they knew a bond asking for this (at $40 million) would have failed. According to the Orlando Sentinel, Winter Park City Commissioner Sarah Sprinkel now finds hersrelf in the middle of a scandal surrounding her former employer, Florida Virtual School. It was not immediately clear what factors led to her resignation in February. Wonder how teachers feel about this kind of part time administrative salary? Shouldn’t she be focused on issues in Winter Park? Took a look at her and the bios of the other elected political leaders in WP which are all a bit disappointing regarding content. Their bio facts solely reflect on their personal professional backgrounds, instead of their visions for the people and places they represent. Local leaders should focus on the stories of their communities and inspire a sense of purpose and cultural identity. They need to consider their constituents’visions and dreams for their community and articulate how they will help make these visions a reality. They should demonstrate how their careers, skills translate to local government issues, and how they will build bridges and create support networks with neighborhoods and the larger community (not just developers) to co-envision and co-create a better Winter Park for all. Many thanks to Todd Weaver and his supporters for doing this — in such a positive, affirmative way. We’re hoping his spirit and ethos positively influences the mayor and the rest of the commissioners. We know he and they have already positively influenced our community. Winter Park City Charter revisions, now underway, can do infinitely more damage to Winter Park than any commissioner can do to help. Only Commissioner Cooper refused to vote for Leary’s nominees. Every other City Commissioner voted in favor of Leary’s crony-stacked Charter Review board. All the kings horses and all the kings men won’t be able to put Winter Park back together again if Leary and his buddies on the Charter Review board have their way with our City Charter – the supreme municipal law in Winter Park because it can only be modified by a City wide vote of the residents. We will quickly see which Commissioners are truly on the side of the residents during the next few meetings.